The picture of a lonely house stranding after Hurricane Ike is real. The paranormal information however is very wrong. So read the real story behind the last house standing! The story begins in 2005, when Hurricane Rita destroyed Pam and Warren Adams home in Gilchrist, Texas. They decided to rebuild their new house on the exact same lot located on Crystal Beach, in a small community comprising about 200 other homes! The Adams’ new home was finished in 2006 and built with hurricane windows, a roof designed to withstand wind speeds of 130+ mph, and a notably 14ft tall, thick, wooden column stilts. All in all, the house was a good 22ft above normal sea level. 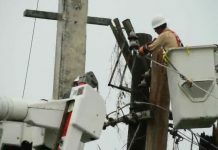 Hurricane Ike struck Gilchrist on the night of September 13, 2008. All houses had been erased… Except the Adams’ home. This aerial picture was taken by Smiley N. Pool, a journalist for the local newspaper, The Chronicler. And the house was dubbed ‘The Last House Standing’. But the story doesn’t end here. The couple moved back in a little after a year following Hurricane Ike, and after two years of fight with insurance companies, bought the property across the street and opened up a popular restaurant called FantaSea BBQ and Grill. 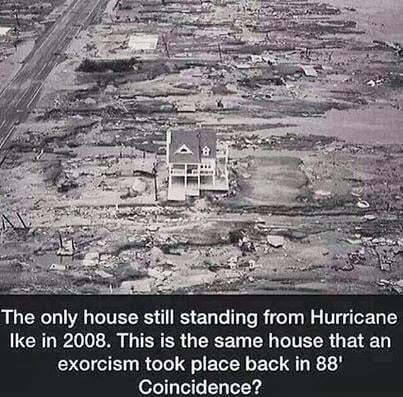 So can you tell me now how can a house have hosted an exorcism in 1988 when the house didn’t even exist? LOL!